Jews first settled in the Canadian territory in the late 18th century. Today, Canada's Jewish population is approximately 375,000 - the fourth largest Jewish community in the world. In 1608, Samuel de Champlain founded the French colony of New France, located in what is now Quebec. The region was settled by strict Roman Catholics, who, under Cardinal Richilieu's decree of 1627, refused the settlement of non-Catholics in the new French territory. It was not until 1760, during the French and Indian War, that the first group of Jews, who were soldiers in the British army, set foot in Canada. The first Jewish settlement was in that same year, made up of Jewish officers, soldiers, merchants, and fur traders. After the British gained control of Montreal on September 8, 1760, a small Jewish population remained in the area. With the lifting of the decree of 1627, after the surrender of all of New France under the Treaty of Paris in 1763, small numbers of Jews began to arrive from the Thirteen Colonies, England, the Netherlands, and Germany. On June 5, 1832, Canadian Jews gained full rights as British subjects, including the right to sit in Parliament and hold public office. The Jewish population of Canada rose slowly but steadily throughout the 19th century. In the 1840s, Jews from Western and Central Europe established small communities in Hamilton, Kingston, and Toronto. The 1871 census stated that, in total, 1,115 Jews lived in Canada, 409 of whom were located in Montreal, 157 in Toronto, 131 in Hamilton, and the remainder scattered along the St. Lawrence Rivers. The gold rush on the West Coast brought small numbers of Jewish traders, merchants, and wholesalers to Vancouver from California, England, New Zealand, and Australia. In 1886, Vancouver became the terminus of the Canadian Pacific Railroad, which drew a handful of Jews who recognized potential business to the region. Also in the 1880s, large numbers of Eastern European Jews escaping the pogroms of czarist Russia sought refuge in Canada. By 1901, Jewish communities had sprung up all over Canada. Montreal still maintained the largest number of Jews, with 6,975, followed by Toronto with 3,103. Winnipeg had 1,164 Jews, Vancouver had 224, and Nova Scotia, 152. From 1901 to 1911, 52,484 Jewish immigrants came to Canada, settling from coast to coast. During World War I, records show that 100 Jewish officers and 4,600 soldiers served in the Canadian army. At least 100 died and 84 were decorated servicemen. However, these records are incomplete and the number of Jews in the armed forces is thought to be much higher. At the end of World War I, in 1919, the Canadian Jewish Congress was founded to provide assistance to Eastern European Jews in Canada. During its first few years, the organization unified Canadian Jewry and established the Jewish Immigrant Aid Society. The CJC was inactive from the mid-1920s until the Nazis came to power. During the 1930s, the Congress fought against Nazi propaganda, raised funds for the American Jewish Joint Distribution Committee, and worked to bring Eastern European Jews to Canada. Its efforts preceding and during World War II led to its recognition as the official representative organization of Canadian Jews. The combination of the end of the war, and the establishment of the quota system restricting immigration into the United States, led to an influx of Jewish immigrants into Canada. However, the relaxed Canadian immigration regulations did not last long. With Hitler's rise to power, thousands of Eastern European Jews sought refuge in Canada, but were denied entry. Two orders-in-council were enacted at this time. First, in 1930, the Canadian government barred all immigration from Europe with the exception of those with sufficient funds to support themselves on farms and those with immediate family already in the country. The second order came the following year with a further set of restrictions. Only British and American citizens with independent means or who were in the farming, mining, lumbering, or logging industries were considered for residency. These anti-immigration policies reflected the mood of the country. Xenophobia and anti-Semitism were rampant with unemployment and poverty on the rise during the Depression. Taking in refugees increased competition for the already scarce number of jobs. In addition, French newspapers and publications attacked Judaism and protested the admittance of Jewish refugees into Canada. Prime Minister W. L. Mackenzie King was sympathetic to the plight of the Jews but was constrained by the widespread opposition to immigration of any kind. In the face of such resistance, the Canadian immigration policy remained stringent. Between 1921 and 1931, only 15,800 Jewish immigrants were allowed into Canada. Canada only took in 8,000, or one percent of the 811,000 Jewish refugees admitted into countries across the world. Mackenzie adopted the policy of “none is too many” regarding the immigration of European Jewry seeking refuge from the Nazis. In 1940, Great Britain sent a number of boatloads of prisoners to its colonies to hold as enemy spies. Unfortunately, around 7,000 Jewish refugees were mistakenly added to these manifests and Canada imprisoned them all the same. The prisoners were held in eight camps across the country, at least two of which housed the Jews together with Nazi prisoners. Though Britain alerted Canada of the mistaken manifests, it took the country nearly three years to free the Jewish refugees. In fact, the British even sent a high-ranking diplomat, Alexander Paterson, to assure the Canadian government that the Jews posed no security risk. Paterson ended up spending more than eight months in Canada and eventually cleared many of the prisoners individually. By 1943, the last of the prisoner refugees had been released - many even went on to make significant contributions later in life to Canada, including two Nobel Prize winners. Canada entered into World War II on September 10, 1939. Approximately 17,000 Jews enlisted in the Canadian armed forces, which constituted more than one-fifth of the entire Jewish male population in the country. Of these men, 10,440 served in the army, 5,870 in the air force, and 570 in the navy. The war claimed the lives of 421 Jews, and 1,971 Jewish soldiers received military awards. Saskatchewan Jews were among the first to volunteer during both World War I and II, and many lost their lives in the European trenches. The province honored those who sacrificed their lives, including a number of Jewish heroes, by naming several lakes and mountains of the vast northern region after them. After the war, the Canadian government instituted anti-discrimination laws and eased immigration regulations. The CJC worked to bring displaced persons to Canada and, between 1941 and 1951, 16,275 Jews immigrated to the country. 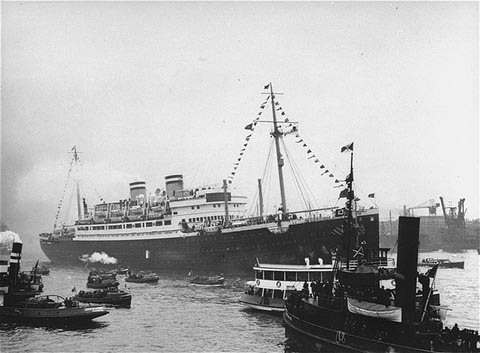 Post-World War II immigration had a major impact on the composition of the Canadian Jewish population. The 1956 Hungarian uprising sent 4,500 Jewish refugees into the country, where they congregated in Toronto. It is estimated that between 1946 and 1960, 46,000 Jewish immigrants were admitted into Canada. Post-war immigration to Canada constituted a much higher percentage of the Canadian Jewish population than that of the United States. By 1990, Holocaust survivors and their descendants made up around eight percent of the U.S. Jewish population while, in Canada, they constituted between 30 and 40 percent of the Jewish community. Jews from various Eastern European countries, the former Soviet Union, Israel, and South Africa immigrated to Canada. During the 20th century, approximately 25,000 Sephardic Jews from Morocco, Tunisia, Algeria, Egypt, and Lebanon settled in Montreal and Toronto. Their Sephardic tradition added a new element to the composition of Canadian Jewry. In the 1970s, the rise of Quebec’s separatist movement and French Language Regulations prompted the predominantly English-speaking Jewish population of Montreal to move to the other English-speaking regions of Canada. After the Parti Quebecois won the provincial election of 1976, a mass migration of 20,000 to 30,000 Jews, particularly young adults, left Quebec. The separatist movement was seen as a threat to the Canadian Jewish community, as an independent Quebec would economically and geographically uproot many of the 100,000 Jews in Montreal and divide and weaken the national community. Due to this widespread exodus, Toronto assumed Montreal’s position as the center of Canadian Jewish activity. After the Liberal Party regained control of Quebec in 1985, and a nationwide economic recession lessened the appeal of the rest of Canada, the Jewish population of Quebec stabilized. Today, the size of the Canadian Jewish community is estimated to be between 340,000 and 380,000, a little more than one percent of the total population of 31.3 million. The majority of Canadian Jews reside in Ontario and Quebec, followed by Manitoba, British Columbia, and Alberta. Approximately 179,000 Jews live in Toronto, 93,000 in Montreal, 22,600 in Vancouver, 14,800 in Winnipeg, 13,500 in Ottawa, 8,000 in Calgary, and 5,000 in both Edmonton and Hamilton. By the 1990s, Canada had become the fourth largest Diaspora community. The B’nai Brith Canada and the Council for Israel and Jewish Advocacy (CIJA) are the two main Jewish advocacy organizations. CIJA oversees the activities of the Canadian Jewish Congress, the Canada-Israel Committee, and National Jewish Campus Life. B’nai Brith’s independent parallel structure includes the League for Human Rights, the Canada Israel Public Affairs Committee (CIPAC), and the Campus Action Initiative. There are about twenty newspapers and journals, including the Jewish Tribune and the Canadian Jewish News, published by the Canadian Jewish community. Approximately 12,000 Jewish children attend Jewish day schools and thousands more attend synagogue-affiliated after-school programs. Canada’s relationship with Israel began in 1947, when Canada was represented on the United Nations Special Committee on Palestine (UNSCOP). Canada and 32 other countries voted in favor of a Jewish state, thus beginning a longstanding relationship with Israel based on a shared commitment to democratic values, understanding, and mutual respect. Canada delayed granting de facto recognition to Israel until December 1948, and finally gave full de jure recognition to the new nation on May 11, 1949, only after it was admitted into the UN. A week later, Avraham Harman became Israel’s first Consul General in Canada. In September 1953, the Canadian Embassy opened in Tel Aviv and Israeli Ambassador to Canada, Michael Comay, was appointed, although a non-resident Canadian Ambassador to Israel was not appointed until 1958. Trade relations between the two countries soon developed. Canada exports agricultural products and raw materials to Israel, which, in turn, exports diamonds, textiles, clothing, and food products to Canada. In May 1961, David Ben-Gurion was the first Israeli prime minister to make an official visit to Canada, and since then officials from both countries have visited frequently. In 1957, after the Sinai Campaign, Lester Pearson, the Canadian Secretary of State for External Affairs, received the Nobel Peace Prize for his proposal that UN troops be stationed in the disputed territory. Canadian troops were part of the United Nations Emergency Forces (UNEF) that kept the peace in Sinai and the Gaza Strip. The Canadian government has consistently supported every step the UN has taken in its effort to find a solution to the Arab-Israel conflict. After 1967, members of the separatist Quebec movement sided with the Arabs in the conflict, and Canada has frequently been at odds with the Israeli government. Relations between the Jewish Community and the Canadian government became strained after the first intifada began in 1987. The conflict undermined public support for Israel and certain Israeli policies divided the Jewish community, making it difficult for Jewish organizations to present a unified front in discussions with the government. When Iraqi missiles struck Israel during the 1991 Gulf War, public opinion shifted overwhelmingly in favor of Israel. But, in 1992, when Ottawa hosted a series of multilateral peace negotiations on the topic of refugees, Israel took issue with the Palestinian representation and refused to participate. In November 1995, a Canadian Federal Court decision stated that Jews from any country could not claim refugee status in Canada because they have automatic citizenship in Israel. Canada and Israel signed a Free Trade Agreement in Toronto during the visit of Minister of Industry and Trade Natan Sharansky on July 31, 1996. The final text was approved by both governments in early 1997. In January 2011, Canada and Israel signed an umbrella pact for defense and military cooperation, which was strengthened that November in light of the turmoil in the Arab world created by the “Arab Spring.” Canadian Defense Minister Peter MacKay and Israeli Defense Minister Ehud Barak signed a number of memoranda of understanding to facilitate information and intelligence sharing as well as cooperative arrangements for the development and sale of military technologies. Canadian and Israeli officials signed a Memorandum of Understanding (MOU) on January 21, 2014, to “deepen their relationship by enhancing their bilateral engagement and cooperation across the widest possible spectrum.” Citing their history of cooperation and Canada’s strong commitment to the survival of the Jewish state, the two countries established a “strategic partnership” through the signing of this MOU. The agreement called for increased security consultations and cooperation, frequent intergovernmental meetings, cooperation in joint research and development projects, and strengthening of counter-terrorism collaboration. The MOU also provided for negotiations to begin to expand the Canada-Israel Free Trade Agreement (CAFTA). In January 2015, Israeli and Canadian officials signed a Memorandum of Understanding between the Department of Foreign Affairs, Trade and Development Canada and the Ministry of Foreign Affairs of the State of Israel regarding Public Diplomacy Cooperation. The Canadian government committed to working with Israel to oppose efforts to single out or isolate Israel. To do this, the governments of the two countries agreed to develop a “coordinated, public diplomacy initiative both bilaterally and in international and multilateral fora to oppose boycotts of Israel, its institutions, and its people,” publicly express their opposition to any who would call into question Israel’s right to exist, and engage in consultations to advocate for Israel. During his January 2015 trip to Israel, Canadian Foreign Minister John Baird reiterated Canada’s commitment to Israel’s peace and security. “The way to accomplish a Palestinian state,” he said, “is dialogue with Israel and not taking unilateral action” in reference to the Palestinians’ “huge mistake” of bringing war crimes charges against Israel in the International Criminal Court. Baird visited Ramallah on January 18, 2015, where he was subjected to protestors throwing rocks, eggs, and shoes at him. PLO official Saeb Erekat published a statement while Baird was visiting that denounced his support of Israel and urged him to apologize to the Palestinians. Baird responded that he was waiting for an apology from Erekat for claiming that Israeli settlement building in the West Bank counts as terrorism, similar to that practiced by the Islamic State. In one of the more unusual exchanges, a Canadian herd of “biblical sheep” was approved to be imported to Israel in February 2016, following initial skepticism from the Israeli Agriculture Ministry. According to the bible, the ancient Israelite Jacob was given a flock of black and white speckled sheep as a payment, a breed today known as Jacob Sheep. Today, these sheep are considered threatened; there are only about 5,000 left in the world, and none left in Israel. Canadian breeders began an effort to reintroduce the sheep to Israel in 2014, but the plan initially did not gain much traction because Canada is not on the Israel Agriculture Ministry’s list for approved sheep imports. The Ministry reversed its objection and the Jacob sheep were brought to Israel in December 2016. The mayors of Toronto and Montreal visited Israel in November 2016, along with 120 representatives from local Canadian businesses and governments. Toronto Mayor John Tory offered his optimistic opinion that the BDS movement had lost momentum in Canada and that its influence had waned on Canadian college campuses. Relations were briefly strained when the Canadian Food Inspection Agency (CFIA) notified Canadian sacramental wine vendors in July 2017 that they should not label wines manufactured in the West Bank as products of Israel. This prompted the Liquor Control Board of Ontario (LCBO) to send a letter on July 11 to the vendors, stating that any products from “occupied regions” labelled as products of Israel would not be acceptable and would be considered misleading. After backlash from Israel and its Canadian supporters, the CFIA stated that a new employee made a mistake that led to the misunderstanding. The agency subsequently said Israeli wines adhered to the terms of the Canada-Israel Free Trade Agreement and no change should be made in the labeling. Canadian International Trade Minister François-Phillippe Champagne and Israeli Economy Minister Eli Cohen signed an updated free trade agreement between their respective countries on May 29, 2018. The new deal abolished excess duties on thousands of products, such as fresh fruit and canned goods. Trade is also promoted by the Export Development Corporation (EDC), which offers lines of credit for buyer credit financing in Israel. Canadian exporters looking to sell goods or services in Israel can benefit from the full range of financial and risk management services offered by the EDC. In July 2018, the Royal Bank of Canada (RBC) announced a $2 million investment in the cybersecurity research center at Ben-Gurion University of the Negev in Israel. This funding will aid in the development of artificial intelligence and machine-learning techniques in the banking industry. In 2018, it was estimated that the Canadian Jewish community numbered 375,000, and approximately 15,000 to 20,000 Canadians reside in Israel. Organized anti-Semitism did not surface in Canada until the 1920s and 1930s when the Ku Klux Klan, Western Guard, and Aryan Nations formed. These hate-groups promoted intolerance of Jews, Catholics, and Blacks. In 1984, James Keegstra, a high school social studies teacher and mayor of the small town of Eckville, Alberta, was charged under the anti-hate law with unlawfully promoting anti-Semitism, including Holocaust denial and Jewish international conspiracy theories. He was convicted in 1985, had the conviction overturned on appeal in 1991, and was convicted again at a second trial in 1992 and fined $3,000. What to do with Nazi war criminals living in Canada was an issue in the 1980s. When the public became aware of the manner in which they gained entry into the country, the Jewish community demanded government action. In 1986, the government appointed Justice Jules Deschenes to investigate. In 1987, he published his findings, which cited corrupt government policies and procedures, including the disregard of regulations that would have blocked Nazis from immigrating. Deschenes looked into 1,700 cases and recommended further investigation into about 250 immigrants, 20 of which required immediate attention from the government. Deschenes’ proposal for trying war criminals in Canada was made into law. In September 2002, Arab students at Concordia University rioted in protest of a visit by former Prime Minister Benjamin Netanyahu. It was the culmination of three years of tension between the Arab and Jewish communities. Montreal police had to use pepper spray on the protesters and made five arrests. In the summer of 2011, after nearly two years of deliberation and investigation, a special Parliamentary Coalition setup to Combat Anti-Semitism released a report that found that anti-Semitism was a growing threat in Canada, especially on campuses and universities. The panel gave several recommendations, including training police across Canada to deal with anti-Semitism and the adoption of a definition of anti-Semitism. B’nai B’rith Canada’s annual audit found that anti-Semitic incidents in 2017 reached record high levels. Continuing the upward trend from recent years, the group reported 1,752 incidents of harassment, vandalism and violence compared to 1,728 in 2016. The starkest increase came in the incidents of anti-Semitic vandalism, which doubled from 158 in 2016 to 322 in 2017. In October 2017, Canada’s first national Holocaust monument was unveiled in Ottawa by Prime Minister Justin Trudeau, who reaffirmed “our unshakable commitment to fight anti-Semitism, racism, xenophobia and discrimination in all its forms,” and said Canada was paying “tribute to those who experienced the worst of humanity. Located in Victoria, British Columbia, Congregation Emanu-El is the oldest synagogue in continuous operation in Canada and has been made a Canadian Heritage Site. The synagogue was built in 1863 and restored in 1982. In 1890, the eighteen Jews of Halifax founded the Baron de Hirsch Hebrew Benevolent Society. In 1894, the congregation bought a church on the corner of Starr and Hurd Streets and established Beth Israel Synagogue. Over the years, the shul has relocated a number of times and has been at its current location since 1956. Photo Credits: CIA World Factbook map of Canada.